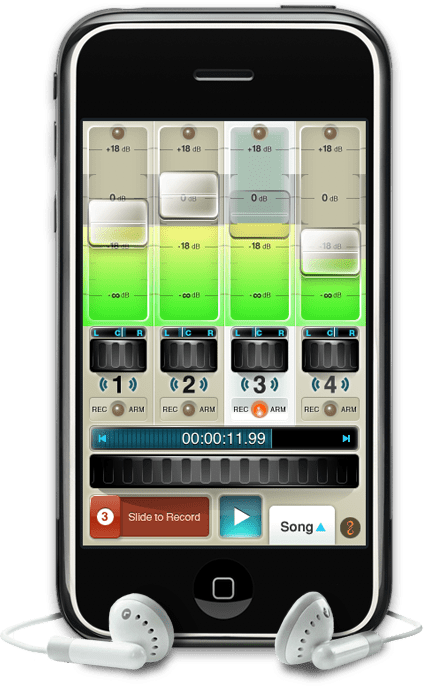 Wow – that’s my response to my first experience with Multi-Track recording on the iPhone using FourTrack (Apple app store link). It’s pretty impressive what I was able to do with little to no difficulty! I really could have invested more time into making a better recording, but I just wanted to see how difficult it would be. This was SUPER easy and intuitive for me. I actually had some nostalgia thinking of my Dad and how he would have loved something like this. He spent hours creating and recording his own music with various forms of technology. Anyway, check out my first recording. I’ll be the first to say, the pitch is a bit off – but that’s my fault for not getting a key center before I started recording. This was just for fun. Technical notes: this is actually a 6-track recording that after ‘bouncing’ or re-recording all the separate channels into one channel I imported into Audacity to add reverb and convert to mp3 format. I did begin to get memory usage warnings, but that was only after recording a 4th track and I never experienced any trouble recording. There were a few times where the program would lock up during playback, but exiting using the home key and returning to the program loaded everything again without error.